I totally forgot I wanted to write a post about this. These aren’t necessarily the newest features of the DiGiCo SD series of consoles, but they are some pretty cool ones that I wanted to point out. The first one makes doing things like virtual soundcheck and personal mixing a lot easier. The second makes it easier to conserve faders on the surface during a big event. Both make a great console platform even better. When it came to virtual soundcheck recording, one of the challenges we had with previous versions of the software was what to do with local inputs. The way we normally set things up was to copy MADI 1 to MADI 2. That essentially takes the inputs from MADI 1 and writes them directly out to MADI 2 without any processing. When we play back, we simply press “Listen to Copied Audio” and the inputs from the rack are replaced with the recorded copies. It worked great. Except for local inputs. Local inputs are on their own MADI bus. And you can’t copy two busses to the same destination. So we had to get creative and use Insert A out to write directly to MADI 2 so we could record those channels. 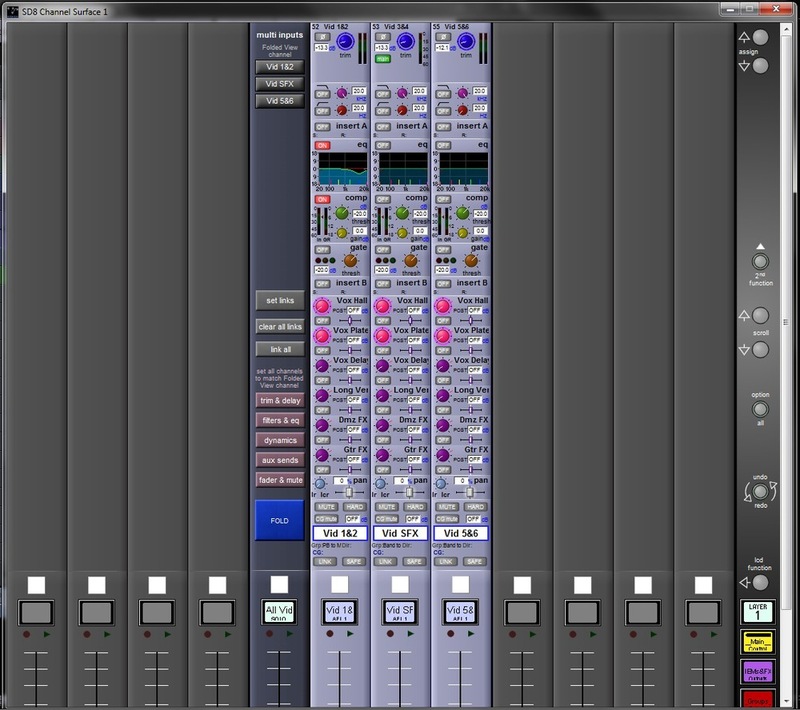 But playback was a problem as we didn’t have gain tracking, and we had to re-patch the inputs. Enter the Copy Audio Matrix. With the Matrix, it’s now possible to copy any input to any other MADI bus. Take a look. It looks unassuming enough, but when you start opening up the matrix, it gets interesting. For example, below you can see that for the most part, the copy is set up 1:1. That is MADI 1 (the Rack) is being copied to MADI 2. But look at Rack Input 16. There is no red square there. That simply means that channel is not copied over to MADI 2. In that case, we were doing some M+S mic’ing of the guitar cab, and I didn’t want the second mic in the IEMs. But I did want to record it. So I copied it to MADI 2:62. I set Reaper up to record both tracks, and when we played back, the console did all the work of re-assigning the inputs to the right channels. And how about those local inputs. We wanted to record all the tracks coming from ProPresenter. Those come in on local AES inputs on the back of the surface. Copy Audio to the rescue. I didn’t really care about the click, so I didn’t bother to copy it. But the rest of the channels would get recorded to Reaper and would be available for Virtual Soundcheck. Another note on this. If you’re familiar with DiGiCo, you’ll know they use a 56-channel MADI mode. Generally, you can’t use anything above 56 for anything. But in this same version of the software, they created a virtual 64-channel MADI device that you can “assign” to a MADI bus. In this case, I configured MADI 2 as a 64-channel device, which allows me to use all 64 channels in the RME MADIFace interface we use to record. So I can capture all 56 channels from the stage rack plus another 8 channels of local inputs. Cool. Another challenge to mixing large events is managing all the faders. The SD8 has 36 faders on the surface (plus master), which is quite a few. But on a big event, they go quickly. Now, I can use VCAs to group channels together for a reduced fader count, and I do that sometimes. But when you want to condense a group of channels down to a single fader, but still have rapid access to all the channels in that group, you need a Multi. A Multi is just that, a group of multiple channels on one fader. You can select up to 11 channels (any or all of which can be mono or stereo) for a Multi. Why 11? I have no idea. Maybe they wanted to do 10, but decided it should go to 11. Anyway, those 11 channels get “Folded” into a single fader. When you move the fader, all the channels move relative to the level of the fader. So if you have 1 channel set at −10 and another set at unity, if you move the Multi fader up by 5 dB, your first channel is now at −5 and the second one is at +5. It’s like a VCA in that way, only the faders move. But if you want to get in and change the levels, just press the Unfold button and the channels spill out on the surface. You now have complete access to all the channels. In this way, a Multi behaves sort of like a POP group in Midas land. Here is an example of a Multi folded, and unfolded. I like to use them for things like Video because I’m often using different channels for different songs. Its easy to adjust the levels, set up a baseline, snapshot those levels then mix them all one fader. So those are some cool things DiGiCo is doing with their consoles. There’s a new software update with a few other features, but that will have to wait for another day.